Stefani Cater is the newly elected State Representative for House District 102, ousting Democratic incumbent Carol Kent. Stefani came from a little house on Bernardin Circle in Dallas and has been doing great things for our community her entire life. But things were not always easy. Her parents let her know at an early age that if she wanted to go to college, then she’d need to work to pay for it. And work she did. Tenaciously. Stefani saved money and studied hard, earning a full scholarship to the University of Texas at Austin. Then Stefani Carter, the local girl who had been challenged to make her own waves, earned the chance of a lifetime, to attend Harvard Law School. Harvard Law was a challenge, in particular because Stefani was one of the very few conservatives and as you might imagine, her views on politics didn’t always match up with her professors and fellow students. Her time there made her stronger and happier than ever to be from Dallas. Stefani truly believes Texas is the greatest place on Earth. Stefani Carter loves our community and as your next State Representative, she’ll work hard to protect our quality of life. Stefani Carter was born and raised in a family of Democrats. That makes for some interesting Thanksgiving Day dinners because everyone in her family has an opinion. Growing up in her family, thinking “Democrat” and voting “Democrat” were always just assumed. But her parents would tell you that Stefani always thought a little different than the rest of the family. In 2004, while Stefani was at Harvard and writing editorials for USA Today, she called her mom and dad and asked them, cryptically, to go out and buy the paper, turn to the inside opinion section and call her back. It was in that column that Stefani explained to her parents for the first time and to the entire nation that she, along with every other black conservative in America should start voting Republican. 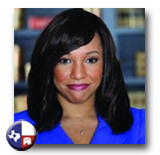 Stefani Carter, who had been born in urban Dallas to a Democrat family, went to Harvard – the bastion of liberalism – and even interned in the Clinton White House under a Fellowship program at school, publicly stepped forward to reject every societal convention that told her how to think and how to vote. Stefani Carter had always been conservative and now she was going to lead the fight for conservative virtues. Starting with her public pronouncement that she was a proud conservative. Now Stefani, with her unique experience, is able to persuade others, who may also have voted Democratic in the past, to reject the liberal notions that “government always knows best” and that failing to take personal responsibility for your actions is somehow more virtuous than carrying your own weight in society. Here’s Stefani’s message: Enough with the socialism and enough with the entitlement mentality. Stop taxing people to death. Let people live their lives in freedom without a meddlesome government peering over their shoulders and taking their cut of every dollar – while providing little service in return. America still provides the world with hope. If we’re not careful, and if we do not fight, this generation will be remembered as the ones who let the dream fail. After law school, Stefani Carter returned home and took a job as an assistant district attorney. She prosecuted criminals and made sure that they were punished to the full extent of the law. While not necessarily a great way to earn “the big bucks”, being a prosecutor was one of the most rewarding experiences of her life. If you meet Stefani in person ask her about the woman she helped who’d been repeatedly and brutally abused by her husband. Somehow the guy had always avoided prosecution. That was until Stefani met the woman, immediately realized the extent of the abuse, and then fought the case tooth and nail to get the abusive husband off of our streets. In the end, her hard work paid off and the abuser went to jail. Stefani has no sympathy for criminals who strike fear into the hearts of the law abiding. Rest assured, having Stefani in the Legislature will help keep our community safe. Great conservatives are not born, but rather made through life’s experiences and an appreciation for certain values dating back to those who founded this country. And in a world in which politicians “say” they’re one thing or another or “promise” one thing or another, Stefani Carter represents something very different. She has actually done something to put her name on the line and stand up for our values. As a contributing editorial writer for USA Today and a fellow at the Heritage Foundation, one of the most well known conservative think tanks in Washington, D.C., Stefani has been a conservative activist and her beliefs have been on record for years. Stefani had to fight to get the opportunity at Heritage. After first being rejected for the position, she wrote to the president the next year, again expressing her interest. In the end, she got the position, and did a lot to promote our conservative ideals. She even attracted the attention of Texans back home. Texas Governor Rick Perry appointed her to serve on a State Board. Stefani Carter will be our conservative voice in the State Legislature. "Enough with the socialism and enough with the entitlement mentality. Stop taxing people to death. Let people live their lives in freedom without a meddlesome government peering over their shoulders and taking their cut of every dollar – while providing little service in return."